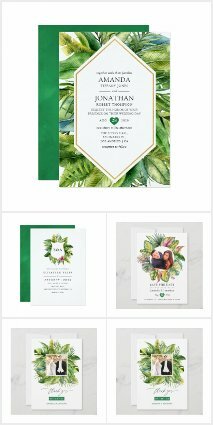 Follow the latest wedding trends via this new wedding blog which aims to feature tips and planning advice for brides as well as a range of ideas for modern wedding invitations, matching stationery and partyware; all created for you by talented designers and available for purchase via Zazzle. Zazzle offers full customization along with access to designers for custom edits and assistance. All authors of this blog are associates of Zazzle. Links going out from this blog may be affiliated. 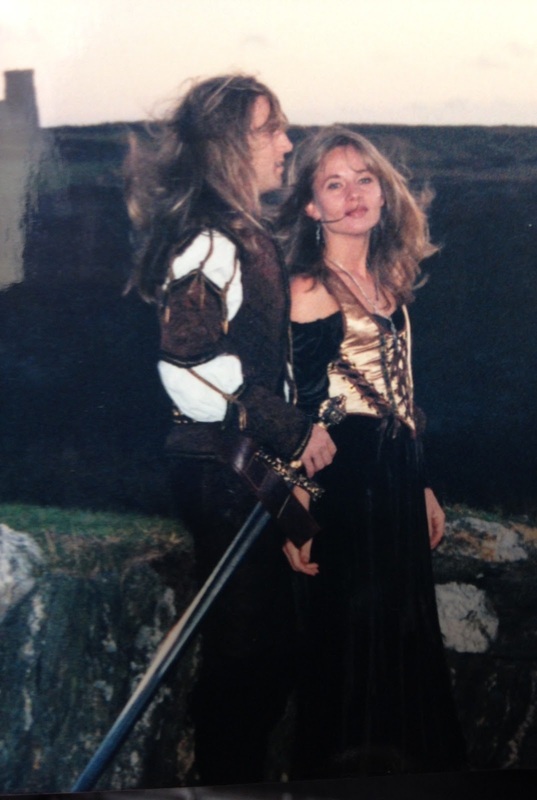 Re-live this romantic love story with author JaneR which climaxed with a medieval wedding at wonderful King Arthur Great Halls Tintagel Cornwall. "I met my husband to be at an airport in California after working at a Music show. Unbeknown to me he had attended the same show. I remember driving to the airport thinking that even though I had just met hundreds of men over that weekend, not one caught my eye and that I would probably never find "the One" as I must just simply be too picky when it comes to men!! It was pouring down with rain when I arrived at the airport and to top it all off our flight was delayed for four hours. I entered the waiting area, which was packed with my fellow flight passengers, when I noticed this dirty blond, long haired man sitting next to some round cases reading a book. The War of the Roses! I felt immediately drawn towards him, an internal instinct that told me "there you are". He felt like someone I had known, someone I had a history with, someone I had loved before. I felt both silly and absolutely overwhelmed. With hardly any seats available I, like many others stranded, sat down on the floor close to where he was and started listening to my music. I had a few people approach me that had visited our stand at the show to chat about our product. Close enough to hear us, I noticed his head coming up a couple of times listening in on my conversations. After exchanging a few smiles with him I finally summoned enough courage to turn to him and ask what he had in his cases. He told me they were Drum symbols and that he had been working at the same show. This then led to us chatting until the hours simply seemed to fly by and our plane was finally ready to board and take us home. The flight was agonising, knowing he was sat in the back of the plane and not being able to continue talking to him. As we landed we bumped into each other again on our way to the baggage claim area, collected our baggage and continued towards the exit. "That's the man I am going to marry". Fast forward a few years and we have now sold up and moved to England. He is a musician and had just signed with a band there. Come to find out we both had a passion for everything old and steeped in history, so England was a welcomed change. He especially was very keen on King Arthur and the Arthurian Legend and called me Lady Jayne right from the beginning of our relationship (...or rather the continuation of something that happened before, in another time, another place.... as that is how we both felt about it). 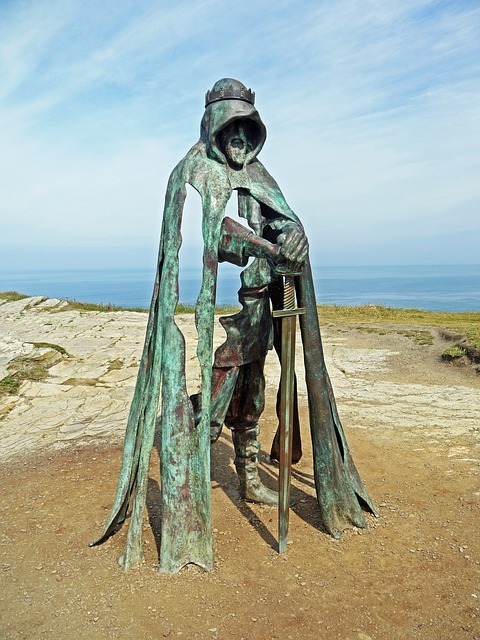 The first time we visited Tintagel was absolutely magical. We both felt as if we had been here before, it felt familiar, a place we once had known and loved, just as it felt when we first met. We walked up to the King Arthur's Castle ruins and then visited the Parish Church of St Materiana , which stands on the cliffs between Trevena and Tintagel Castle. We both knew right away that this is where we would get married. Our next stop were the King Arthur Great Halls . Not knowing they existed at the time, we entered what we thought was a Souvenir shop. We soon started talking to the curator of this Souvenir shop as he on seeing my husband to be said " You look like King Arthur". He went on to tell us all about this so called shop and the Great Halls and urged us to take a tour. We were led into a medieval looking room with grand pictures depicting the story of King Arthur. We were asked to sit down, the lights dimmed and a narrator began to tell the story of the Legend of King Arthur. At one point it was told that he received his sword, Excalibur from the Lady of the Lake, who in this story was called Nineve. As soon as I heard that name I knew that if I ever would have a daughter I would name her Nineve, the Lady of the Lake. I am pleased to say we were blessed with a beautiful daughter who now carries this beautiful name. Anyway, after we the narrator finished, we took a tour of the Great Halls and were absolutely astonished to see what this ingenious man, Fredrick Thomas Classcock, had built and left for generations to see and marvel at. Next we went to see the Camelot Castle Hotel, which simply put the icing on the (Wedding) cake. Everything we wanted was right here in this beautiful place called Tintagel. 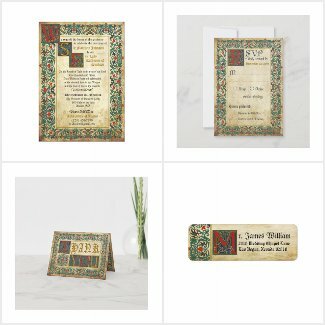 To help you plan your perfect Medieval Wedding find below some customizable medieval themed wedding stationery, decorations and costumes! 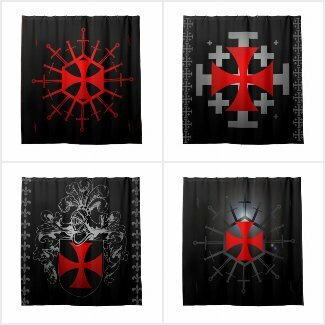 Featured here is a wonderful wall tapestry (featuring a vintage print) of medieval knights. This would make a wonderful decoration for your wedding ceremony or reception or as a photo booth back drop! 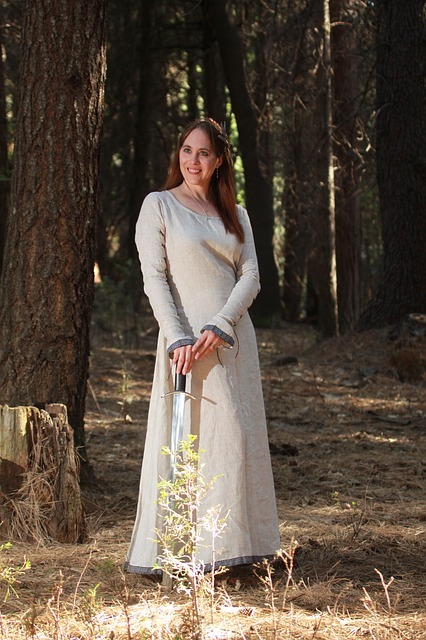 For medieval wedding clothing you can opt for King and Queen costumes, or a Knight and Lady Guinevere theme or a regular Lord and Lady. 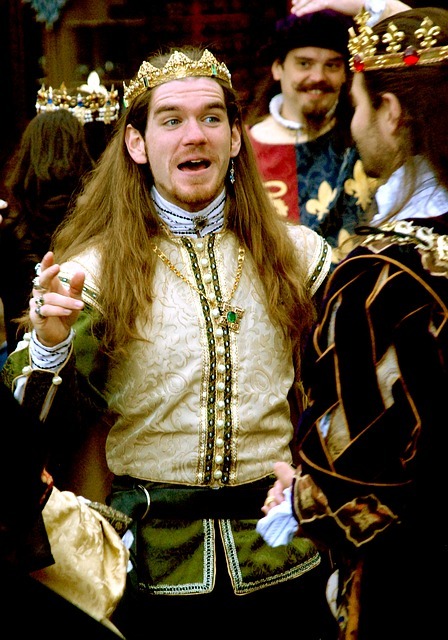 Your guests can be similarly dressed but not of course as Kings and Queens! 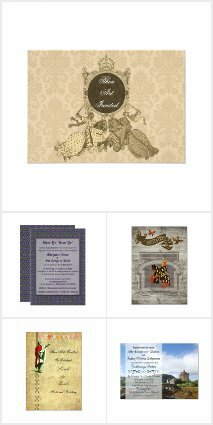 Weddings with a medieval Game of Thrones theme are very popular which is why it is great to have wedding invitations based on that theme! You may contact authors here. If you do not want your comment published add the words -Private Message for - to the start of your comment, and it will be forwarded accordingly. Thank you. Please share your ideas, and stories here. We welcome real life wedding stories too so if you'd like to share your joyous day with the world, drop me (LeahG) a line here. 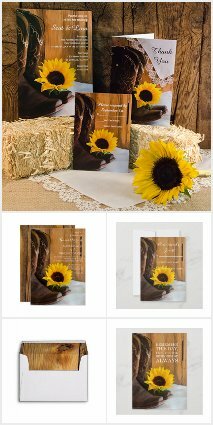 Welcome to the wedding blog - a resource for modern brides authored by talented Zazzle Designers and Bloggers. 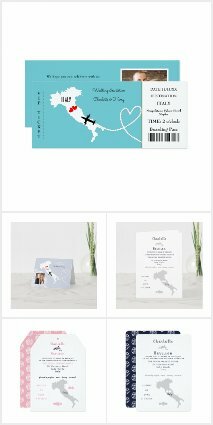 We're a small collective of Zazzle friends who have come together to provide a comprehensive resource for brides. We each have a variety of strengths in stationery design and trend awareness. You can learn about individual authors via the author bio pages. We consider custom design requests and are happy to hear your ideas for new products. Drop us a line, we're here to help! Have fun browsing the site and subscribe for updates. My English Beach Wedding and a pick-up truck! LeahG Editor - Copyright Protected Content. Awesome Inc. theme. Powered by Blogger.